Even after wood is harvested and turned into furniture, it continues to be a living, breathing material that responds to its environment just like a tree would in the forest. It expands and contracts with changes in humidity, and wood also changes color over time as it’s exposed to air and sunlight. Today we’re sharing examples of how dramatic—and beautiful—these color changes can be. Fresh-cut maple is light and bright and then takes on a deep honey color. 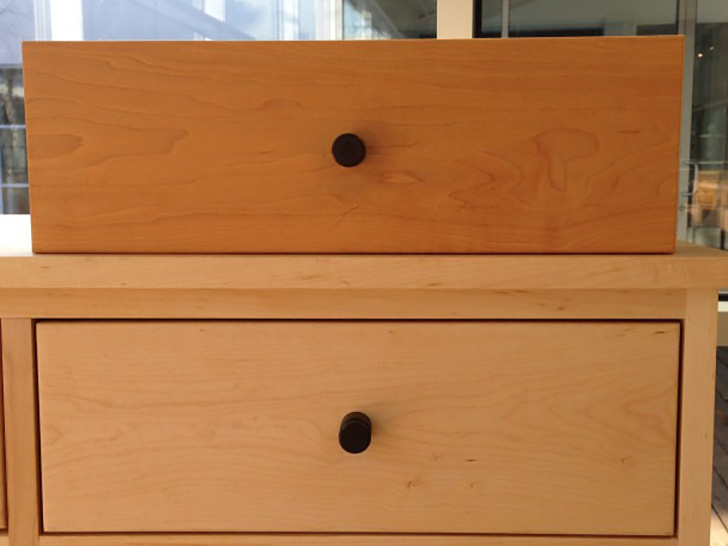 Here’s an example of a brand new maple office cabinet (below) next to a drawer from a much older cabinet (above). Like maple, cherry gets darker over time. 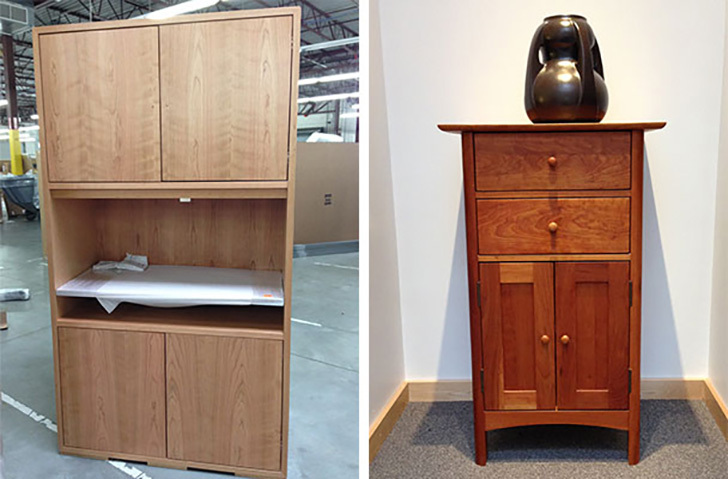 Here’s an example of a fresh-off-the-truck cherry bookcase (left) next to a cherry cabinet we’ve had at our headquarters since the 90s. A little shocking, no? New walnut has a consistent dark brown color but as it gets older it does two things. 1) Unlike maple and cherry, it gets lighter and 2) a rich honey color starts to come through the grain. 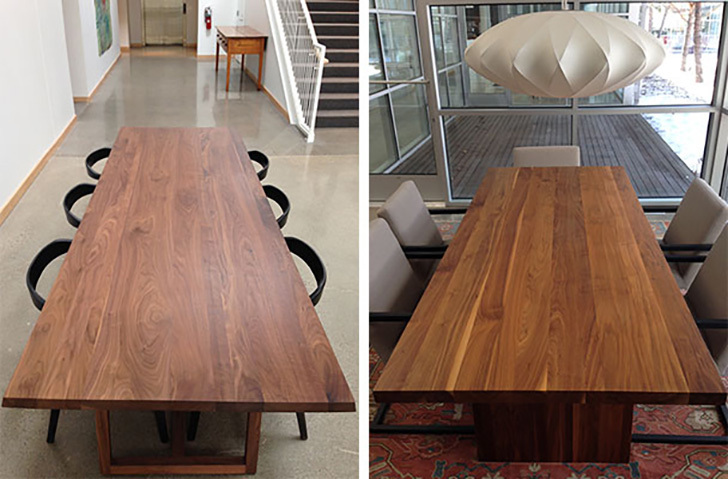 These beauties are our new Davis table (left) and a Corbett table (right), which is about four years old. Color changes tend to be the most dramatic in the first year, even in the first few months. Here’s a tip from our (unfortunate) experience: move items around on your new wood furniture so you don’t get spots that are darker or lighter. 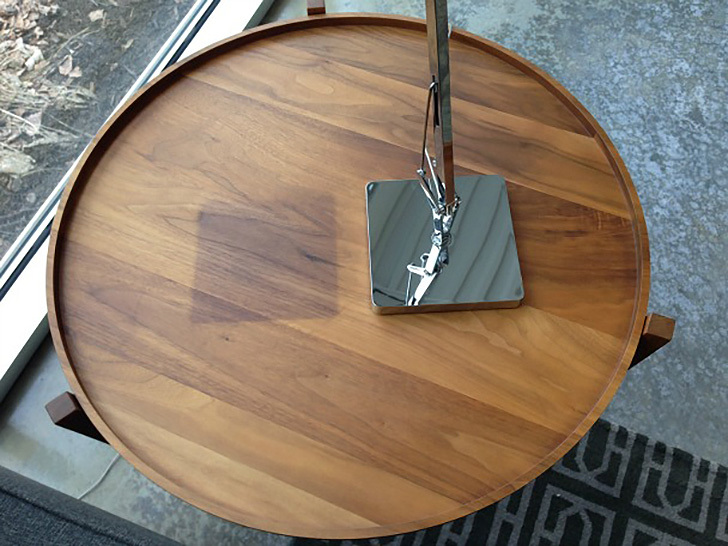 For example, here’s a walnut end table in our office that we put a lamp on a few years ago and then never moved. Lesson learned. If this happens to you, don’t panic—because the color keeps changing, the contrast will even out with time. Nice post on cleaning the furniture items and make it healthy. Thanks for writing such a nice post. I have a 43 year old solid mahogany dresser. I want to refinish the top only. What would I need to do to match the original color? I don’t have as much experience with mahogany, but as a general rule, when you sand down the top you’ll expose a lighter color wood underneath. If the dresser is important to you, I would recommend working with a local woodworker or furniture repair professional to safely remove the old finish and perhaps stain the surface so it matches the rest of the dresser after refinishing. Good luck! We recently had our 20 year old oak dining set refinished and it came out darker than we expected (yes a small test section was done on the underside of a leaf – but while we stood there, so one coat and no dry time). My question is….will the finish naturally lighten over time? It is in a bright kitchen. No direct sunlight but near south facing sliding door…so very bright room. Hi Sam, Oak darkens over time into a deeper amber color, and I don’t think the sunlight exposure would offset that natural process much. It does not darken as dramatically as cherry, but it will probably darken a little. Sorry to tell you that when you are hoping for the opposite! Wow this is really helpful. I have only recent discovered the joys of woodworking.and started building some stuff for my backyard with yard with teak. But it turns gray. J wanted something that would keep its color more. To put in my front yard. Now with this site I have a better idea of what to with work better to keep its color. I’m thinking Cherry now. We recently installed a maple tongue & grove V-joint ceiling. The product was not stained but did receive a nicely done clear coat finish. Although the product is absolutely lovely, it is very light in comparison to the original sample piece we received…almost completely whitewashed. Needless to say, we were a bit concerned. So, thank you for the informative blog. The write-up, as well as the photographs, are quite helpful. It is comforting to know the natural wood coloring will eventually come through, providing a more enhanced wood tone appearance…correct? Correct, Nancy! Maple will develop a rich honey color as it ages, becoming less white and more golden. This article is incredibly helpful! Over a decade ago when I started buying high quality solid wood furniture for my home I was not educated on how wood changes color. I bought several natural cherry pieces which looked close to the bookcase example but now look like the cabinet example. The wood is beautiful but the red/orange tone of it now clashes with the rest of my home. I’m now constantly pondering what to do about it, feeling bad about wasting so much money to replace it. This article would have saved me all that money and anxiety about how to remedy the issue. I now make my friends and family buying wood furniture to read this article and their reaction is always shock and happiness they are now informed. Thank you so much for posting this! Great website! I am Wonder if you could tel me why the inside of the drawers of an old desk have turned a pinkish red hue? Its a mystery to me… thanks! Hi Rebecca, I’m guessing it’s the natural color change of whatever wood the drawer is made of. Sounds pretty! We have natural hickory which I have loved for many years. It is now extremely golden. What can I do to restore them? We have large artful pieces of redwood that we have had for years. Three months ago we began raising the humidity in our home for health reasons. It appears that the redwood is darkening. Could this be? We are in Az. and quite dry. Hi Roger, they sound gorgeous! Humidity certainly plays a roll – wood that is dry is lighter, wood that is hydrated is darker. Is Room & Board walnut furniture stained with a dark color, or a clear stain? I just got my walnut dresser, but they gave me a satin wax that looks dark and pigmented. Hi Christina, Some of our pieces, including your dresser, are finished with oil and wax, which is not tinted when it’s applied right after the piece is built. If your dresser starts to look a little dry or lighter in color you can reapply the Satin Wax for Walnut to restore the darker color and moisturize the wood. However, if you like how the walnut lightens over time and don’t want to bring back the darker color, you can get our regular Satin Wax that doesn’t have this tint to it. Up to you and what you like! Speaking of Satin Wax…we love our Linear bedroom set (in natural cherry) that we’ve had for 20 years, but after recently reading the ingredients and warnings on the bottle of Satin Wax, I’m hesitant to use it! Is there a more natural product that will keep our lovely cherry furniture well hydrated? Thanks. Love that you’ve had your Linear pieces for 20 years! Just what we hope for – made to last. Satin Wax does have a splash of mineral spirits in it – this helps it dry faster and go on a little easier. If you’d prefer, I believe our Customer Care team can send you an alternative – it takes a little longer to dry but no mineral spirits smell while it’s drying. 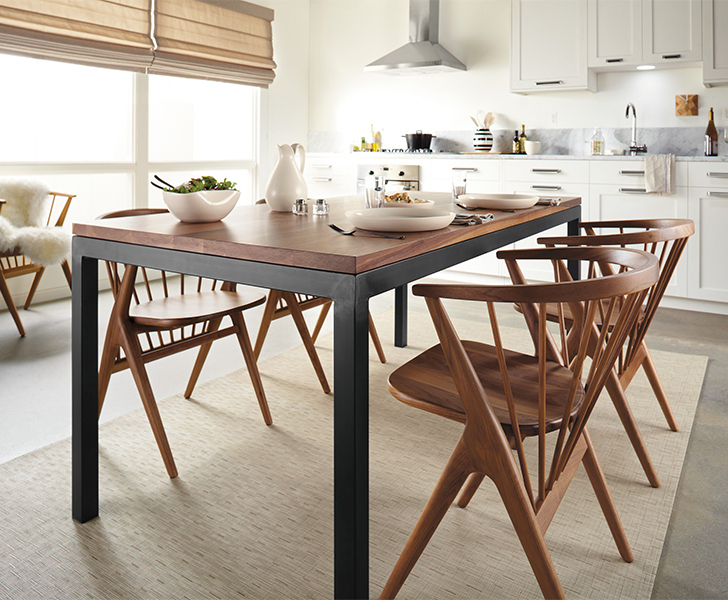 You can get in touch at shop@roomandboard.com or 800.301.9720 – or chat with them online when you have a minute. Enjoy those cherry beauties! I was wondering if there is anything I can put on my natural walnut floor so that they stay the natural color and not go golden? Aside from staining them, I don’t know that there is anything you can apply that would keep this natural color progression from happening. A local wood flooring company may have ideas to offer.